The following documentation debunks the BLM's entire narrative that they had no idea there was a mine at Sugar Pine Mine, and that two BLM employees just happened to stumble across it, by chance, one day. What a crock of Jim Bull that is! Naturally, we have an abundance of evidence against the Bureau of Land Management and won't be releasing all of it on the blog - a lot of it is being kept for other purposes. "There's a fairly big footprint to it. There is no plan of operation that would cover the level of work they are doing there. For something as intense are we're seeing out there, they're going to need a plan of operation." Not only is that statement ridiculous and outrageous, it is simply a lie. Further, having Surface Rights, the Sugar Pine Mine is not required to file any type of plan or notice with the Bureau of Land Management, because they do not control the surface. The Sugar Pine Mine is not on Public Land either, as defined by FLPMA (Federal Land Policy and Management Act.) The quote below is from the BLM's own website, from - BLM Policy Manual 2804 - Applying for FLPMA Grants. "Because of the rarity and intricacy of these type of claims, it would be strongly advisable to proceed in any action with Solicitor consultation." Later, some of the correspondence with the State Geologist and other BLM employees seemed a little terse and overly critical of everything he wrote. We found that out of everybody involved in the case - and we're talking people from across the entirety of BLM National - he was the only one to do decent research. BLM just didn't like what he found - nothing to support issuance of noncompliance orders. Nothing to support their erroneous decree that the Sugar Pine Mine Surface Rights had been severed. 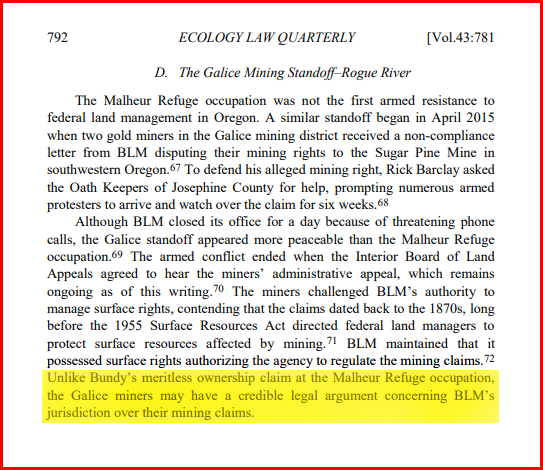 BLM Oregon's own Solicitor - the one who wrote the argument for the case with his gazillion helpers - admitted to not reading the Surface Resources Act of 1955. Was this statement made publicly (knowing it would be subject to FOIA) in an attempt to indemnify himself? Did he see the writing on the wall? The Surface Resources Act of 1955 is the legislation that BLM conned congress into passing, claiming its purpose was to make it easier to eject non-mining, trespassing occupiers off the claims. Instead, they used the act to pick off nearly every pre-1955 mining claim in existence, from legitimate miners, in order to void their claims and re-take control of the surface. What they are attempting to do at the Sugar Pine Mine is just another installment of the BLM's ongoing, perpetual land grab. These are the two provisions we supposedly violated - 43 CFR 3715 (Occupancy) and 43 CFR 3809 (UUD.) Both clearly describe the scope of the regulation as applied to Public Lands, as defined, again, in FLPMA. Their own Rights of Way Guide clearly describes a Pre-1955 claim as being something other than Public Lands. Even the United States Forest Service recognizes the difference between Pre-55 claims with Surface Rights and Post-55 claims that lack such rights, plainly pointing out the extent of a Pre-55 claim holder's rights in Section 2813.13 of their Forest Service Manual 2800. By contrast, FSM 2813.13b points out that Post-55 claims do not have an "exclusive right to the surface", adding that such claims: "are subject to the rights of the United States to manage and dispose of the vegetative resources, to manage other resources except locatable minerals, and to the right of the United States, its permittees and licensees, to use so much of the surface area necessary for such purposes and for access to adjacent lands." The following documents prove that Medford BLM did indeed know there was a mine there, and that their AML Unit (Abandoned Mine Lands,) were coveting not only the Stamp Mill, but the mines themselves. The documents below are SHPO Forms. They are used to record site data when the State Historic Preservation Office is interested in a particular place, building, area, or item, for inclusion in the NRHP, the National Register of Historic Places. How did they manage to survey and record mine groups in 2010 that they claimed the didn't know existed in 2015? Did somebody lie? BLM lied? Lied to the American public whom they are supposed to serve? Also, you may recall, THIS POST - a video starring one of the two Stamp Mill fetishists admitting that it is one of his "favorite" Cultural Resources, and if somebody owns it, well, they have "environmental protection laws," "Congress," and the "Judicial System" to bludgeon you with, should you not want to hand over your personal belongings to them. The redactions on the documents are all by BLM - we've obscured nothing. The so-called "Cultural Resources" on any document from BLM or the other land-grab management agencies are always redacted to "protect" them. These are the actual PDFs sent to us as FOIA responses and we have not altered them in any way. Bear in mind that there is no legislation whatsoever - not ARPA, (The Archaeological Resources Protection Act of 1979,) and not even SMCRA (The Surface Mining Control and Reclamation Act of 1977,) - that would allow them to take a working mine from the owners, nor steal legally-conveyed items of private property. 30 U.S. Code § 1234 - Eligible lands and water, (a sub-section of the Abandoned Mine Reclamation code) defines what is deemed an abandoned mine and what is eligible for reclamation. The Sugar Pine Mine and Black Jack Group are not abandoned mines and never have been. They are not eligible as abandoned mines under US Federal Code, as you can see. Also, SMCRA, legislation that was crafted specifically for the OSM (Office of Surface Mining,) was designed specifically for Legacy Coal Mine reclamation and clean-up of sites contaminated by surface mining of coal. The OSM has now been absorbed by the BLM. During the whole Sugar Pine Mine Incident (as BLM likes to call it,) the media focus was on the Oath Keepers, militia, insurgents, anti-government domestic terrorists, and so on. Not one of them cared what the real story was - they were just waiting for somebody to start bleeding. (They must have been overjoyed at the state-sponsored murder of LaVoy Finicum.) The real story never really got out through the press. Problem is, most of these reporters are not journalists, they are activists. Therein lies the problem. And in our experience, non-profit news orgs are fully controlled by the narrative their funders want to push. Bad News. Fake News. Unfortunately, even people who supported us against the BLM couldn't get the story straight. Even Jerome Corsi didn't get it quite right! Ironically, the one and only group of people who understood the issue were Berkeley Law (see below) - who, despite being ultra-Liberal, agree that we may have a sound legal case. (We do. Water-tight, by the way.) But even they had a few details wrong. We no longer entertain media inquiries. What's the point? There was even one anti-government / Sov-Cit-researcher, who fancies themselves as the premier expert in the field, who actually told Mr. Whittington that he was in physical danger from us. We were shocked by this. Dismayed, even. Thankfully, Mr. Whittington seemed to know who they were, saw the agenda, and appeared to dismiss them. And we know exactly what they were trying to do. It's a wonder we're all still alive. This is an evil, damaged person filled with hate - someone, we believe, is fully compromised, and therefore, a puppet on a sting. What a horrible life. Some people don't understand why the Oath Keepers were on the mine. The reason is simple - co-owner, Rick Barclay, asked the Oath Keepers to launch a security operation because BLM and other federal agencies have a long history in this region of burning down cabins and stealing equipment. Plus, it was something he experienced personally, several years ago, at the hands of the U.S. Forest Service. They even murdered his partner's cat - by arson - when they burned down his cabin. But they didn't get 5-year prison sentences for Arsenal Terrorism, nor Animal Abuse. Of course not. BLM's history of arson and destruction is just plain fact - regardless of what they claim. 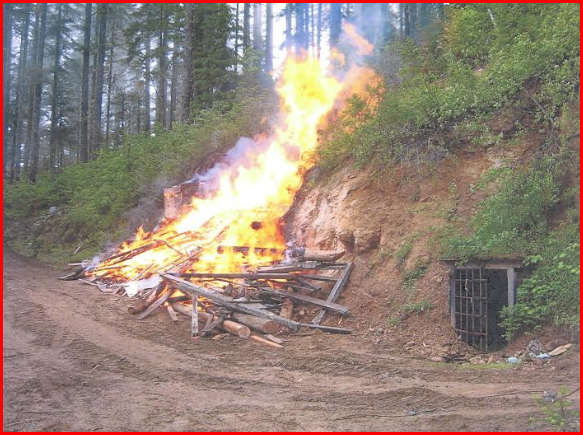 This is the arson of the late James Edgar's bunkhouse by USFS near Cottage Grove, Oregon in June, 2009. "Schmidt and the Forest Service had no authority to impound and assert government ownership over plaintiff's mining structures for the purpose of destroying them." There are also other things, very grave things that we cannot divulge right now, but that will come out soon - these will show the Security Operation on the mine was entirely justified and necessary. For the record, we have significant evidence in many safe places, just in case somebody, somewhere, decides to play a game of SWAT the Miner. There are literally thousands of pages of documents that will be released, should our Dead Man's Switch ever be engaged. And not just about our own case, either. This is not over-dramatization. Remember LaVoy? We do. The story of what happened before the noncompliance notices were issued has never really been discussed at all, and only touched upon even by us, so, below is a summary of what started the whole mess. Two BLM Archaeologists with a long history of trespassing on the mine (we subsequently found out,) appeared at Sugar Pine on 14th January, 2015. Contrary to the official story, they were not just coincidentally in the area - their purpose was to carry out their annual Monitoring Project for SHPO, the State Historic Preservation Office. Having an actual Monitoring Project in place means that they are more than likely being funded by SHPO, since these are carried out at the behest of the agency. They were not in uniform. They did not identify themselves, even although they knew there was somebody on-site - they could hear the caretaker's generator. The two Archaeologists were riding around the claims on ATVs - which were not government property. We believe that they were not on duty, because they knew they should not be there, and knew they were trespassing, because they knew the claim was Pre-1955. We also have evidence of that too - from their own files on the mine...that they didn't know was there. The mine's caretaker was mercilessly harassed and threatened with a "Grand Jury" and "the D.A., by a BLM Special Agent, probably because the Archaeologists had made a police report that they were "held at gun-point" - something one of them has also stated in public, although he made no reference to such an incident in his report of the day's events, which we have published previously. The caretaker was not aware of who they were - he assumed that they were vandals or thieves - something the mine is not unfamiliar with. They were also acting suspiciously, like they were trying to avoid him even although they knew he was there. They were messing with equipment, taking photographs. There has been equipment stolen or damaged at the mine on more than one occasion, and the caretaker had all his equipment stolen from his own nearby mine - the reason he was caretaker on the Sugar Pine in the first place. Every piece of equipment he used to make a living with, rendering him unable to work, and, at that time, unable to replace it. He promptly called George, the co-owner of the mine who asked him to block the road with his vehicle and try to find out who they were. So, he did. At no time did he brandish a weapon at them. He had a side arm, unloaded, in his hand, which is perfectly reasonable, considering their suspicious behavior. He didn't even raise his voice, just asked them who they were. In fact, the caretaker was barefoot in his jammies. The true instigator of the problems was a 50 year old Archaeology Technician, who has an obsession with the Sugar Pine Stamp Mill, a fixation on a previous owner, and who mocked the caretaker, making snide comments like what do you think this is, 1872? The Archaeology underling's authority had been challenged and there was no way he was letting this upstart get away with his insolence. This is his property. His mine. His Stamp Mill. Soon after, a letter was sent to BLM, stating that the mine was Pre-55, as they were well aware, and that any attempt to shut down the mine would be met with prompt legal action. The BLM raced to slap noncompliance notices on the mine in an attempt to subvert the owners' Fourth Amendment Right to Due Process (which they did, by the very nature of Administrative Law,) and to tie them up in the Department of the Interior's own court, the Interior Board of Land Appeals. As of this date we are still waiting for a decision - three years later. What they had done - the trespassing, the attempt to take an item of private property and give it to another agency, with whom they colluded and conspired, place it on the NRHP, essentially stealing it from the owners, shutting down the mine, was so bad they had to cover it up. And so was born a massive effort to do just that - cover up what the Raiders of the Stamp Mill had done. This was a horrible mistake on their part. The abuses and crimes committed against the owners just snowballed to ridiculous proportions. They altered documents, they forged signatures, they told lies, the launched smear campaigns against one of the researchers, they spread vicious, dangerous lies online, lies that could have cost the mine owners their lives. This is not drama or hyperbole. It should be noted, also, that the one item missing from the inventory of items on the noncompliance notices to be removed from the mine was the Stamp Mill - they demanded the destruction or removal of every other piece of personal property - except that. Medford District BLM is the biggest BLM office in the country, a veritable monster with over 300 staff, both part and full-time. This long history of abject abuse of the people, west-coast-wide, by BLM has to end. None of them are ever held accountable for their actions and they act with impunity, safe in the knowledge that absolutely nothing will happen to bring them to task, as the only overseeing body is the Office of the Inspector General, which only cares if a federal employee is causing government waste, which means stealing from them. They have no interest in punishing those who steal from us. The time is ripe for this to change. I can tell you right now, the two Archaeologist who instigated the actions against the Sugar Pine Mine (and who we believe made false police reports about being held hostage at gun-point to BLM Law Enforcement,) are still meddling with other mining claims. We've even heard the two of them have been barred by BLM's Grants Pass Resource Area from entering claims. Predictably, they are ignoring even their superiors and still doing whatever the hell they want. Because that's just what sociopaths do. I know, from the AML Unit's own records and research that, they are also trespassing on private, patented ground also, and trying to steal other Cultural Resources, as they call them. To us, they are our belongings. 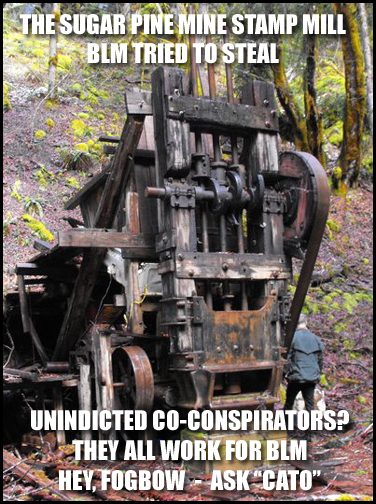 They are items of private personal property, like the Black Jack Stamp Mill they've been coveting for years. But they don't care. Because they're the government. And who is going to stop them, these monarchs of the Fed? Actually, we are. And we're hoping that the Judicial System that one of them raved about helping him in his larcenous cause, will do the right thing and end this abuse. We have high hopes that the system can still work. Our meme below features the online persona of the instigator of the Sugar Pine Mine Incident (who has the bare-faced gall to accuse our Legal Researcher of that very thing.) He used this alter online, concealed who he was and who he worked for, and proceeded to make up the most ridiculous lies, in an attempt to connect us to the Bundy Family, to whom we have absolutely no connection whatsoever, neither socially, philosophically, or politically. We are essentially Federalists - miners rights are Granted Rights from the Congress of the United States, which makes the whole anti-government schtick laughable. BLM are the ones who are anti-government - they do not work for the people, nor this country. I won't bother linking to the forum mentioned in the meme - just search for the name and you'll see just who and what these people are. In my opinion, fully compromised puppets. And Cato isn't the only federal employee with an ID there. Stay tuned! LOTS more to come! Keep up the good work to bring these thieves to their knees! If they can't be controlled by the legal system, how are they going to stay in line? Anonymous, the problem is, the BLM answer to no one. OIG doesn't care - we've sent numerous complaints and they just hand them over to BLM to investigate themselves - they find themselves Not Guilty 100% of the time. You never even hear about it. OIG only care if an employee is stealing pens and paperclips. They don't care if they steal from peons like us.